Hate to interrupt the countdown to Kentucky, but on a 08-09 note, the Alabama Sportwriters Association just named Marquette-bound Nick Williams the 6A (highest division) player of the year for the state. Great stuff, JP. Thanks for posting, and we'll add it to the next media update. ... and thank YOU, Ben for that tip as well. We'll have that link included in tomorrow's media updates. "How does Marquette win? 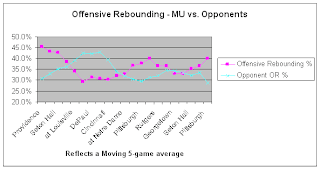 Marquette has established their ability to win on the defensive end. 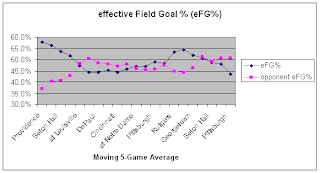 Everything derives from the defensive pressure on the perimeter. Unfortunately, our offensive capabilities are not at the same level." Sounds like you are describing my beloved Wildcats. Don't forget our defense has been pretty good, too. If this team loses in the 1st round they'll be taking it to their grave. Their fking grave. If MU is better than their seeding then Kentucky(who shouldn't even be in the tourney), should pose little challenge. Anything other than a sweet sixteen for this team will be a huge disappointment. No more excuses get the job done. My prediction is that if MU doesn't make the sweet sixteen once in the next 3 years Crean will be gone. The alumini have had enough. This team clearly has the talent to make a run. Thanks for the analysis but we do know this team. This is a ball club that has elite eight talent but lacks consistency. A team with a coach who still doen't know how to attack a zone defense. A team that still has their bigs hedge way to high on screens which allow easy baskets time and time again. A team with a pt. guard with immense ablities but can start a game 0 for 11 throwing up brick after brick after brick. A team that if they had a Bo Ryan would be a threat in the tourney every season. A team that wasted a season of eligibility on possibly a quality inside player. A team that hasn't won squat since D. Wade. A team that has the 3rd highest paid coach in the country. A team who better be hitting jumpers come tomorrow or attack the rim. A team who fouls way, way, too much. A team who has had a total of 1 post player in the Crean era and he was a transfer. A team who inexplicibly is named the Golden Eagles in lieu of The Warriors, and this great University has lost millions of Alumni dollars because of idiotic political correctness. This team better win a fking game or believe me heads will roll in the next few years. Get the kid from Butler to come here for a third of Crean's salary. Wow, that last post was very hateful. I just wanted to comment on how little faith the voters have in the "How will MU fare against UK?" poll. Yes we haven't won a tourney game since Dwayne Wade, but every year it is a fresh slate, and I've got to think that the bad taste in the mouth from the two previous years has to give out juniors an edge. I'm not blind to our weaknesses and all, but I do like to believe at least in basketball that hope springs eternal! I find Rosiak's replay of DJ and TC's talk "over dinner" very curious. You mean to tell me with all of his great coaching (in game and at practice)and ongoing shouting during games, a junior who is a 2nd team BE player, who could graduate in three years still does not know what is expected of him? Zouch! There is something mighty wrong here. I still question this team's chemistry. reality....what a major pill to swallow. and by the way...pretty good with #'s too. let's start with the latter first. inside the university...we finally got smart and moved out of the Cords era into the WHAT??? Cottingham era...the animals during the ice age had a better chance than we do. Crean...are u kidding?? i hope he has been and continues to give D. Wade his fair share of his salary, because Crean hasn't earned squat!!! See...blowhard.